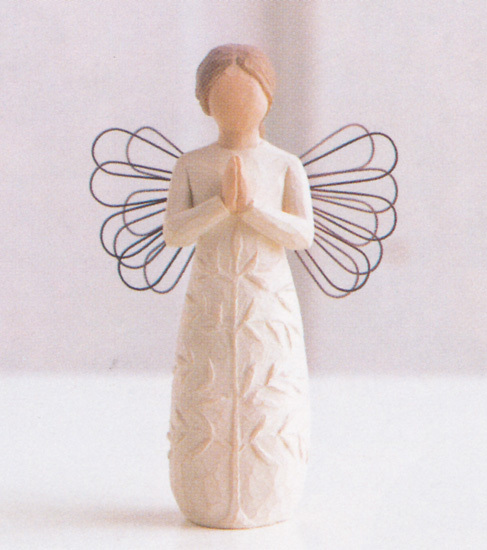 This Willow Tree figurine perfectly describes one of my dearest community members. The first non-family member I called when Pedro received his cancer diagnosis was my college roommate, Carolyn Sturges. She’s the kind of friend that I only see every couple of years, but our conversations pick up where they left off the last time—whether it was a phone call six months ago, or a visit three years ago. “Pedro has non-Hodgkin’s lymphoma,” I announced bluntly. “Not a problem. We love having them visit with us.” I knew she meant it. Pedro felt well enough to go camping at Big Lake during the last few days of camp, so we drove to central Oregon and enjoyed some peaceful evenings with just the two of us in our RV. We picked up the girls on Sunday morning and headed home, stopping for the night at Carolyn’s. By the time we reached Red Lodge, the niggling headache that had been bothering Pedro had turned into a full-blown, raging headache that caused him to vomit at the least movement. We pulled into a campground late at night, hoping that all he needed was a break from the motion. Unfortunately, Pedro wasn’t any better for having stopped. If anything, he was worse. By the time we reached Bozeman, both girls were thoroughly traumatized from Pedro’s vomiting (he is a wretched retcher who gets esophageal tears when he vomits). Over the next few days, the vomiting and headaches worsened. Finally, we went to the ER to see if they had any ideas. They admitted him for pain management, and started testing him. Over the next few months, Pedro deteriorated rapidly. By October, a secondary infection almost claimed his life. I shot desperate prayer request emails off on a daily basis. Miraculously, the tide turned and Pedro started to recover. The doctors finally declared the cancer vanquished and the time for a stem-cell transplant had arrived. Stem-cell harvesting should be a short, three-days-at-the-most process. Pedro, of course, defied all odds. After two weeks of daily apheresis and Neupogen shots to the stomach, we were starting to feel the financial crunch of living in hotels and wandering around the city looking for food Pedro could taste. Our daily routine started at seven, when we would wake up and ride the MUNI to UCSF and Pedro would check in to the apheresis unit. I would wander off to Starbucks to eat my breakfast, then look for Internet service to hunt for cheap flights home or hotel reservations. By one or two, Pedro would finish, and we would leave in search of Indian food. Because we were living day-to-day—never knowing if today would be the last day of apheresis, our hotel reservations were hit and miss. Some days I’d find a deal for two nights at a hotel, but when I’d look online the following day, there would be no cheap rooms left and we’d have to switch hotels. I explained where our hotel was, and waited impatiently for Pedro’s apheresis to finish so I could share the good news with him. “Absolutely,” I answered as I helped him up the steps to the MUNI train. After an incredibly good meal at a nearby restaurant, it was time to tell Mark and Carolyn and their kids goodbye. “Have you ever read John Adams by David McCullough?” Carolyn asked as we walked back towards the hotel. “I haven’t. Is it good?” I smiled to myself. We always randomly recommended books to each other—some things never change. The goodbyes distracted me, and Pedro looked tired, so we made our way to our hotel room without ever picking up the conversation about the book. Five minutes later, the hotel room phone rang and I rushed to answer it. Maybe it was the hospital with news that they’d harvested enough stem cells and that Pedro could go home. “Be right down!” I ran down the stairs for one last hug goodbye and some reading material. “I will,” I assured her, “I’m getting tired of magazines.” I went back upstairs and settled into a comfortable chair to read and wait for the phone to ring with the stem-cell count. The book fell open on my lap as I gazed out the window, wishing for escape from my worries—would Pedro ever have enough stem cells? Would the endless bills and expenses ever get paid off? It might be convenient for the hospital to have Pedro as an outpatient, but our bank account sure took a hit. I struggled with my fears, and decided that I could do nothing, other than give my fears to my Father. I whispered a prayer, than looked down, ready to start reading. The book had fallen open because there was a fat bookmark pushing the pages apart. A green and white bookmark consisting of several hundred dollars. No doubt about it—God heard the silent cry of my heart before I even uttered it, and he provided with a refreshing visit from a dear friend and money to help us out. It wasn’t until nearly four years later that I stopped at Carolyn’s house again. We dove back into our friendship and our conversation as if we’d seen each other last week. “Did I ever tell you about Pedro’s tree?” Carolyn questioned. “He helped Mark plant it right before he was diagnosed with cancer.” She pointed to a tall, healthy tree in their back yard. Tears filled my eyes. Who would have known that a monument to a miracle thrived in my friend’s back yard. Communities come in all shapes and sizes—distance and time make no difference to a community of prayer warriors who leave books and pray under trees. Join us each week as we explore the art of story.